In addition to the story, which centers around a 14-year old boy with psychic powers and the codename Gunvolt, who has been put to work by a human rights group called Feather to assassinate a virtual pop star named Lumen. Feather acts to protect the psychics who are being rounded up into concentration camps by the conglomerate Sumeragi Group, who have done so in the name of protecting the world but secretly perform experiments on their captives. 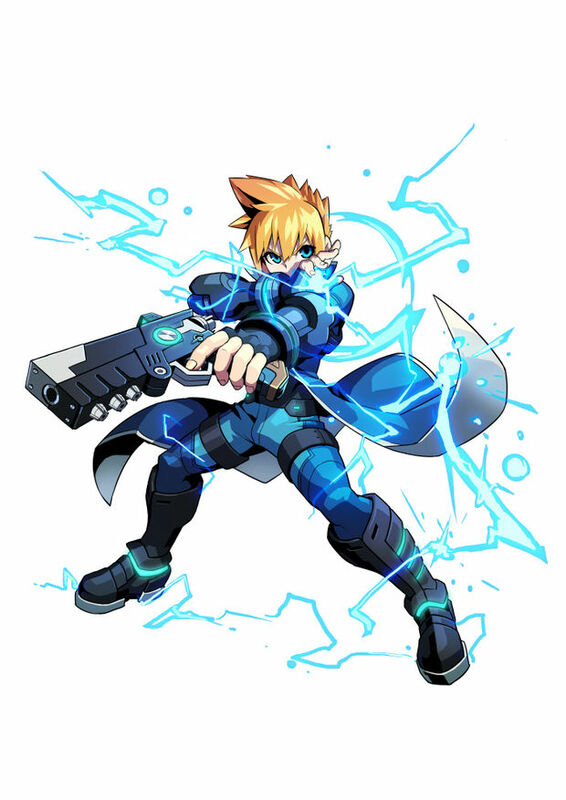 Gunvolt's power is known as "Azure Striker," hence the title, and it allows him to control lightning. He joins up with another psychic named Joule, a 13-year old psychic who was created in a Sumeragi lab, and can enhance the power of other psychics through song. However, through her virtual pop star avatar Lumen, she is used by Sumeragi as "sonar" to find and capture other psychics. Joule begins living with Gunvolt after he rescues her. Gunvolt is armed with a Conductor Gun which isn't too powerful on its own, but features rapid-fire capabilities. Used in conjunction with Lightning, though, it can lock on to targets and increase its power. Lightning itself is activated by the R button, and it generates a protective shield which also damages enemies while they remain in contact with it. Offensively, its enhancement of the Conductor Gun can be amplified up to three times by holding down the R button, allowing several enemies to be targeted for attack chaining, which racks up more points. Another attack is the "Voltic Chain," which is activated via a button on the touch screen. In doing so, a series of chains reach across the screen, and Gunvolt charges them with electricity to do damage to enemies. Outside of attacks, Gunvolt can not only run and jump, but dash, double-jump, and even dash in mid-air-- sort of like some other guys we know, presumably. More abilities are yet to be revealed, and will be obtained as one progresses through the game. Not too many enemies have been seen so far-- only two psychics: Daytona and Melac. Daytona controls fire, allowing him to create explosions. Combined with his slide and leap attacks, he's said to be a difficult one to dodge. Melac is just as much a handful, as he is capable of creating wormholes for a series of unpredictable attacks, able to strike through one and have it come out of another. His special attack allows him to fire lasers through several wormholes at once. We'll bring you more as it comes, but for other tidbits and more art and screens, check out Destructoid's report. You can also find their hands-on impressions of the game so far here.